Petmate®, the worldwide provider of fun, trusted, quality products to enhance the lives of pets and their families, and country music superstar Miranda Lambert are teaming up to launch the new MuttNation™ Fueled by Miranda Lambert brand. Every purchase will help fund rescue and adoption programs of MuttNation Foundation™, the organization established by Miranda and her mother Beverly Lambert in 2009. The comprehensive collection of bedding, collars, leashes, toys, apparel, feeding and watering products reflect Miranda’s lifestyle. The product unites a country chic feel with a rock & roll flair, the vintage prints and antique hardware are inspirations of her signature style. A value of over $110! Do you have a Thomas and Friends fan who’s ready to learn to ride a bike? Dynacraft has the perfect solution! They recently introduced a 12 inch Thomas and Friends bike with training wheels that is just adorable! You can see this bike in action and find out more about it at Thrifty Nifty Mommy. The cute racing shield and wheel covers will help your little train enthusiast feel like a conductor as he rides the Dynacraft Thomas the Tank Engine Boys’ 12″ Bike, which features a customized frame with fun themed graphics. The bicycle also features a talking Thomas and a whistle play feature for fun. Adjustable training wheels help you customize the bike to your child’s needs. A rear coaster brake helps keep your little rider in control of the action. Open to the Lower 48 US States only, ages 18 and up. Ends at 10/20/16 at 11:59 PM EST. The Happy Home Cottage and Grill by Step2 is a toddler’s dream playhouse that resembles the home, plus it has a grill! Little ones can pretend play as they are grilling, cleaning and welcoming guests into their very own home. The realistic and charming exterior of this kid’s cottage will look great in any backyard. The outdoor fun never ends with this outdoor kid’s playhouse. Made in USA of US and imported parts from China. To celebrate the launch, we’re giving one away too! Open to the continental US only, ages 18 and up. Ends 10/19/2016 at 11:59 PM EST. Disclaimer: One winner will be randomly selected using the Giveaway Tools random selector and notified via email. Once notified, the winner will have 48 hours to respond or a new winner will be chosen. This giveaway is in no way associated with Facebook, Twitter, Instagram, Pinterest or Google. Void where prohibited. Protecting your family is important. There are many things out there that can harm us, and one of those happens to be Carbon Monoxide. It is deadly because it is colorless, odorless, and tasteless. It can sneak up on us and cause symptoms that mimic the flu. If not caught, it can cause lethal levels of dosage that can be detrimental to you and your family. Do you want to take that risk? Having enough of these in your home is important because like your smoke detector you need to ensure you can monitor these levels on every floor of your house including the basement, and in every bedroom, whether they are yours, children, or that newborn. I am participating with Tom’s Take On Things and First Alert to help give one of these monitors away. 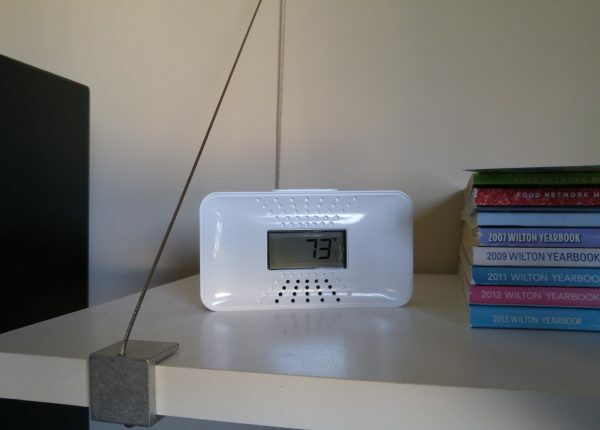 This particular model has a back-lit display, and can measure the temperature where it is as well. They can be mounted on the wall, or sit nicely on a shelf, or dresser. The First Alert CO710 Carbon Monoxide Alarm has a battery that lasts 10 years, with no need to change them for the life of the alarm. After about 10 years it will alert you when the battery has expired and you will need to replace the unit. This giveaway is not associated with Facebook, Twitter, Pinterest or any other entity. First Alert is responsible for prize delivery. Tom’s Take On Things, or any of the other bloggers helping were neither paid for this post, or responsible for prize delivery. If you have any questions, or would like to see your product/service featured like this, contact Tom from Tom’s Take On Things here. This awesome giveaway is for all parents who love lunchbox lunches. To remind us all of the benefits of foods rich in fiber, Entenmann’s® Little Bites® and Nature’s Harvest® teamed up to sponsor this giveaway prize. Check out some sandwich and lunchbox ideas for the back-to-school time on Celebrate Woman Today. A winner of this giveaway will receive their prize pack to celebrate more fiber and snack ideas this back-to-school season! Giving my dog treats for special occasions or as an everyone day reward is just one way to show them I love them. Another way, is making sure the food and treats I do give them is filled with the best, natural ingredients possible to keep them happy and healthy. Golly Gear has created a great product to help – Turkey Hearts Dog Treats. Want the chance to get some for your dogs? 3 winners will receive a bag of Golly Gear Turkey Hearts Dog Treats! Who doesn’t love a delicious sweet snack now and again? Just because school has ended, you can still give your family a fun and tasty snack they will love as part of their lunch or afternoon treat. The new Sara Lee® Peanut Butter Crème Filled Cakes are the perfect flavor combination and everyone will love the great taste. Peanut + chocolate + snack cakes = these new, wonderfully delicious individually wrapped treats. Sara Lee® Snacks is introducing NEW Peanut Butter Crème Filled Cakes. These deliciously rich and moist chocolate snack cakes are made with a light and fluffy peanut butter crème filling and wrapped in a smooth chocolate coating. Starting in April in the Easter US, the new Sara Lee® Snacks Peanut Butter Crème Filled Cakes are made with real peanuts. Sara Lee®, the iconic American brand, delivers a new way to snack with fresh baked, individually –wrapped snack cakes. Now you can take along the quality and heritage of the Sara Lee® brand wherever you go. Sara Lee® products are baked by Bimbo Bakeries USA, a leader in the baking industry known for its category leading brands, innovative products, freshness and quality. Available at most major retailers nationwide, be sure to pick up this and other Sara Lee® are something your family and friends will squeal over. 1 winner will receive a Sara Lee Prize Pack ($43 Value)! Carbn Monoxide (CO) poisoning is the number one cause of accidental poisoning in the United States and is responsible for an average of 400 deaths, and an additional 20,000 people seek medical attention anually.Sadly,nearly three-quarters (73 percent) of CO exposure is in the home, and more than two-fifths (41 percent) occurs during the winter months of December, January and February. CO poisoning can be difficult to diagnose because symptoms mimic those of many other illnesses, including the flu, and can include nausea,headaches, dizziness, weakness, chest pain and vomiting. Most important it occurs sooner in those most susceptible: young children, elderly people,people with lung or heart disease, people at high altitudes or those who already have elevated CO blood levels, such as smokers. CO poisoning also poses a special risk to fetuses. Because of all of this it’s important to keep your loved ones protected! The NFPA (www.nfpa.org) recommends one CO alarm on each level of the home and in a central location outside each sleeping area such as in a hallway outside the bedroom. For premium protection against carbon monoxide poisoning, First Alert offers a 10-Year Alarm Life Sealed Battery Compact Carbon Monoxide Alarm. The brand’s first solely battery-powered 10-year CO alarm, this device features a digital display that shows detected CO levels in parts per million. The unit uses an electrochemical carbon monoxide sensor – the most accurate technology available – and allows you to capture and retrieve the highest CO levels recorded in your home through the peak function. The stylish and versatile carbon monoxide alarm also displays ambient temperature on an everyday basis while protecting households from CO exposure. Equipped with the long-life sealed lithium battery to power the alarm for a full 10 years without need for replacement, the carbon monoxide alarm is a step above the competition in product life expectancy. 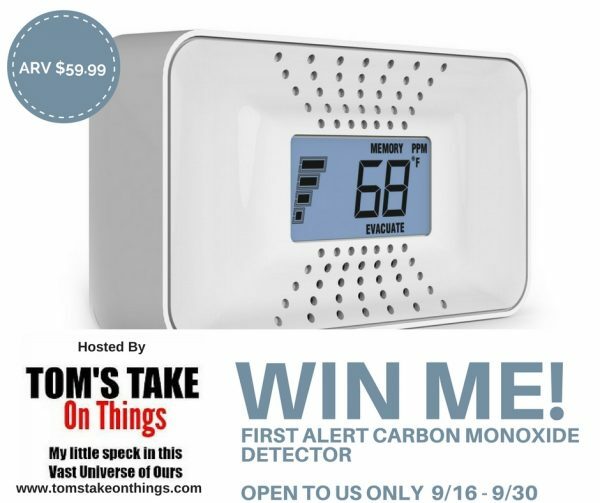 Head over here to see what Conservamom thought of her First Alert 10 Year CO alarm! To learn more about 10-year alarms and alarm laws in your state, or tips for protecting your family from smoke, fire and carbon monoxide, visit the First Alert website.To purchase your own you can head over to First Alert, Amazon or most local hardware stores. First Alert wants to keep your family safe and are giving one lucky reader the chance to own their very own 10-Year Alarm Life Sealed Battery Compact Carbon Monoxide Alarm. Just head below for your chance to enter to win! Giveaway is open to US only and ends on June 14th, 2016 at 11:59pm EST . Must be 18yo to enter.